Adam has a degree in operations management from Kansas State University. 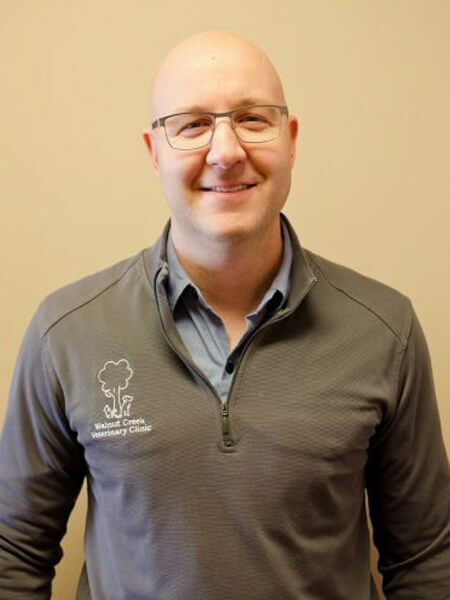 He currently manages 3 clinics, Ridgeview Animal Hospital in Omaha, Walnut Creek Veterinary Clinic in Papillion, and our newest addition to the veterinary family, Skyline Veterinary Clinic in Elkhorn. He is married to Joanne, who is the owner of Ridgeview Animal Hospital in Omaha. They have five children: Jack, Lucy, Vivien, Jay, and Eddie. Their family pets are a cat, Mellie, and a Border Collie/Shepherd mix named Tex who was rescued from a shelter in Dallas, and Angus the cattle dog, adopted from Heartland German Shepherd Rescue. 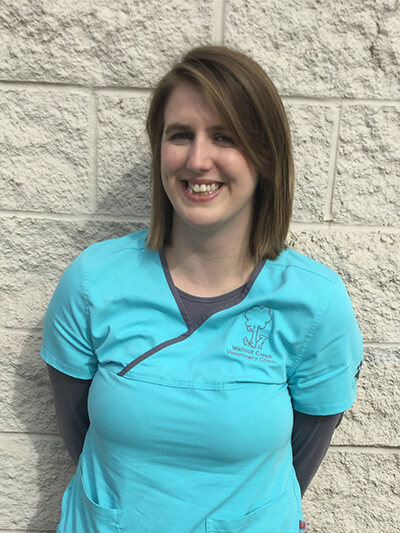 Shannon is a licensed veterinary technician who graduated from NCTA and has been with us since 2001. Her technical skills are incredible! She is knowledgeable and friendly. Shannon transitioned into the administrative role in our practice in 2012. Dr. Gaines and Shannon worked together prior to opening Walnut Creek. She has a dachshund named Stella, and her and her husband, Jay, have three sons, Gavin, Malik, and Braden. 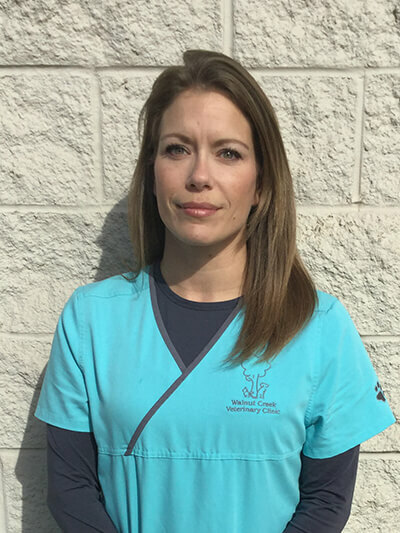 Shannon is the practice administrator for Ridgeview Animal Hospital, Walnut Creek Veterinary Clinic, and Skyline Veterinary Clinic. Dea and her husband Kevin have 3 kids – Logan, 8, Emily, 6, and Adelyn who is almost 1! They also have 2 senior Scotties, Albert, and Mcgee. They have 2 cats Bubba and Morgan. Dea has been a licensed vet tech since 2007 and got her degree from Vatterott College! She also has a bachelors degree in biology from UNL. 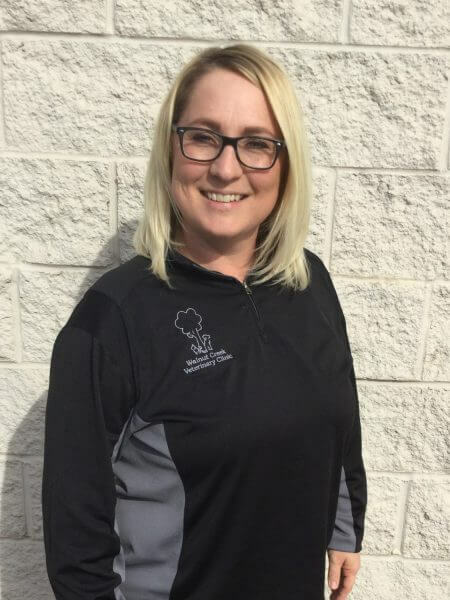 She started doing administrative work with us in 2016 and became our clinic manager this past year in 2017. 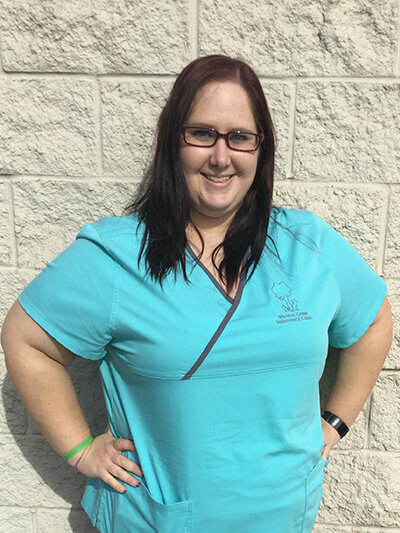 Kelly is from Omaha, Nebraska and received her degree as a veterinary technician from Iowa Western Community College in 2015. She started her internship with us in 2014 and has been part of the team ever since! She has two dogs, Macey, a Jack Russell Terrier and Larry, a Weimaraner. 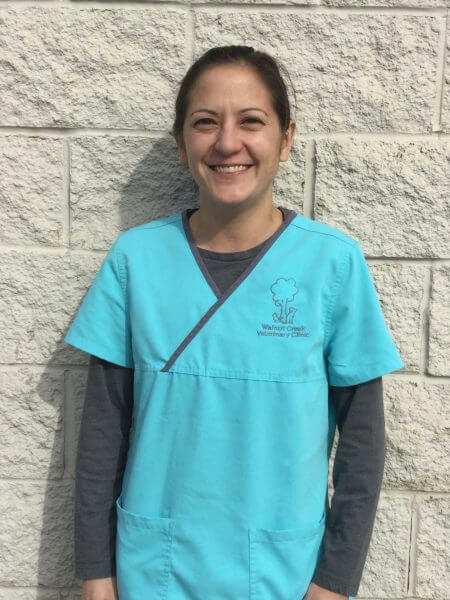 Kerry joined Walnut Creek Veterinary Clinic in March of 2017. She has been a licensed technician since 2005 and brings with her a lot of experience. Kerry and her son, Aiden, share their home with a wide variety of pets. They have a pack of rescued dogs and cats and a tortoise and two bunnies, Snips and Captain Rex. Briana is a 2017 graduate of Iowa Western and received her veterinary technician degree. She has two pit bulls named Primrose and Nymeria, and a kitty named Tyrion. When she’s not studying, she enjoys spending time with her husband, building furniture, and watching Netflix. Angela grew up in Las Vegas, NV and she wound up here because her family lives here in Nebraska. She wanted to work in Vet Medicine since she was a year old. She attended the College of Southern Nevada and her first job was in a kennel in 1994. She also has a 19-year-old cat and she used to bottle feed her and her siblings. In her free time, she likes to play the violin, attending the symphony, go to the movies, the zoo, and fairs. She is also an avid gardener. She has one daughter Alexis and they love having fun and being happy. Sarah received her degree from Vatterott College in Omaha. She is married to Ketrick and resides in Glenwood, Iowa with their adorable son, Keaden. They have three dogs, Diesel, a Rottweiler, Angel, a cute little Maltese-mix rescue that needed open-heart surgery, and Annie, a Pomeranian, who is also a rescue dog and follows Angel like a shadow. Sarah also has two cats, Squeak and Little Mew. Jess comes to us from Salt Lake City, Utah. 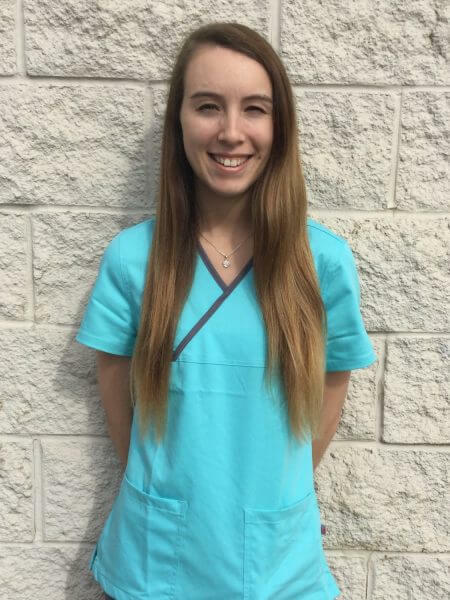 She is a Vatterott graduate from the 2015 spring class and is a great addition to Walnut Creek Veterinary Clinic due to her knowledge and background with animals. Jess and her husband, Fernando, have two Siberian Huskies named Lobo and Luna, who they enjoy taking out for long walks. Lisa grew up in Byron Illinois and moved no Nebraska with her boyfriend Dakota in 2017 to go to school at Iowa Western. She realized her love for animals when she was young and grew up with border collies and loved spending time with them outside. She was always bringing home animals and turning their house into a zoo! Lisa ended up adopting Millie, a beagle mix, from the clinic she did her Iowa Western observation hours at. She also has two cats, Iris, who is lazy as can be, and Ivy, who loves to cuddle and play with toys. In her free time she likes to pet sit, go to concerts, travel, and spending time with her friends and family. Starting her work experience with animals at our Walnut Creek Veterinary Clinic. 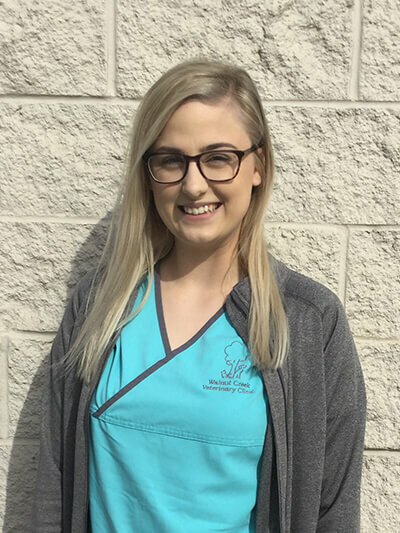 She received a veterinary assistant certification through the Animal Behavior College and spent a little bit of time at Iowa State University. Michaela and her fiancée have a cat named Kallie and they enjoy spending nice days outside doing activities such as hiking, horseback riding, and fishing. Alicia was born in Denver, Colorado and grew up in southeast Iowa. She is married to Josh and they have two kids, Kolby (4) and Thea (2). They also have a Vizsla named Cooper, and two cats named Luna and Mali. She enjoys spending time with family, traveling, teaching Cooper new tricks, and the Minnesota Vikings! An Elkhorn native, Jessie graduated from Elkhorn South High School. Her interests include painting, listening to music, and watching The Office. Jessie has two dogs named Doc Holliday, a Beagle/Bulldog mix and Lois Lane, a pit bull mix. 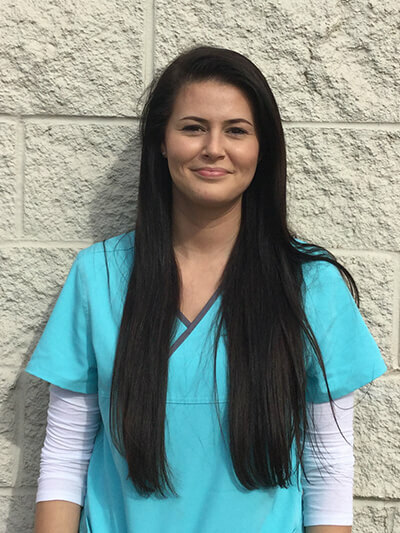 Jessie joined Walnut Creek Veterinary Clinic in the Summer of 2016. 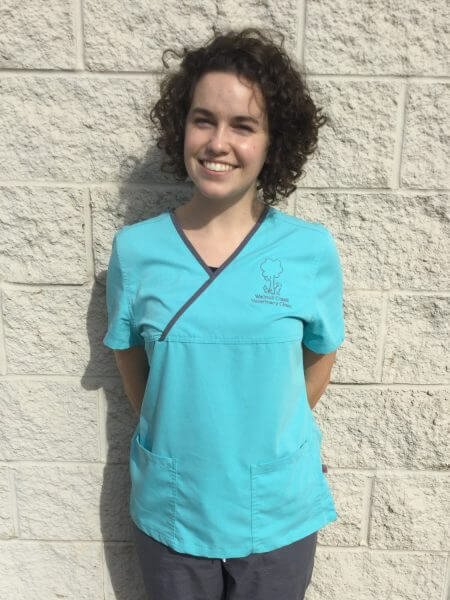 Violet joined the team at Walnut Creek Veterinary Clinic in the summer of 2017. She was born and raised in Omaha, Nebraska, spending most of her life turning her house into a menagerie. Her current partner in crime is a goofy cattle dog mix named Sophie—the two of them wreak havoc by curling up on the sofa with a good book. 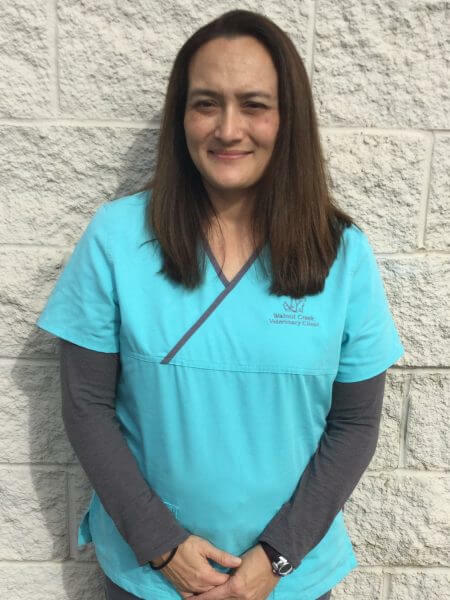 Nelly grew up in Bellevue and ended up at the clinic by chance and decided to try something that involved her love for animals. She went to Bellevue West high school and Iowa Western Community college. After finding out culinary school wasn’t for her she realized she was more of a customer care person. She has a dog named Noel and she is a border collie mix. In her free time she likes to watch movies, read books, or playing D&D with her friends. Stacy grew up in England and moved to Bellevue in 1985. She has loved animals and animal care for as long as she can remember. After reading the James Harriot Novels she had originally wanted to become a Vet. She has a dog named Chewy and he is a 9 ½ year old Chihuahua mix. He was adopted from a previous employer in Bellevue. In her free time she enjoys reading, going to the movies and spending time with her boyfriend, Mario. Jerry Ravnsborg grew up on a Farm where you learn to do all kinds of things. He has a BS in Business Administration and owned a manufacturing company, where he later went into technical sales of industrial automation in a three-state area. As a retiree, he enjoys living on an acreage with his wife Carol of 51 years. Their Son is Dr. BJ Ravnsborg, located at the Walnut Creek Veterinary clinic. They have a Daughter Amy in KC who is an air traffic controller. Their family has 4 grandchildren, two boys, and two girls. He enjoys working with his hands and currently provides maintenance services for Ridgeview, Walnut Creek and Skyline Clinics.